36% of passenger cars and about 40% of light trucks had at least one tire that was at least 20% below the correct pressure. 26% of passenger cars and 29% of light trucks had at least one tire that was at least 25% below the correct pressure. When asked 85% of car drivers didn't even know the correct tire pressure for their vehicles. Every year thousands of fatal accidents occur and are caused by premature failure of tires that are not correctly inflated. In today's cars, we have displays, gauges and warnings for nearly every vital component. We monitor fuel, oil pressure, engine temperature, etc, warning sounds if our seatbelt is not fastened or a door not properly closed. However the most vital component is neglected, the one which is actually carrying and supporting us on the road, our Tires. 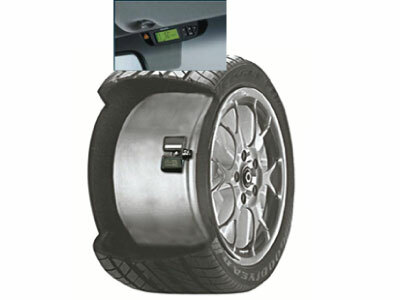 Our TPMS is a sophisticated sensing device designed and engineered to measure and display real time tires operation. It alerts the driver instantly of any tire pressure or temperature irregularities whether the vehicle is in motion or stationary. Your tires, each with a contact patch on the road of about the size of a large footprint, have to provide the entire grip for steering, braking, accelerations and improve comfort whilst carrying the weight of the vehicle. Correct tire pressure is essential for keeping tires in good condition, to provide optimum performance and give maximum life. It's the air pressure that keeps tires fit and safe and carries the weight of the vehicle and its load, not the rubber or the casing material. Correct tire pressures are vital for safe handling and optimum steering, braking, and grip.